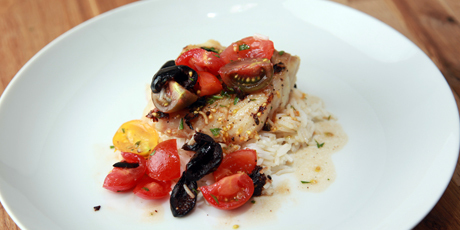 A tasty fish dish paired with rice and a tomato salad. A must-try! 1. Season cod with salt, pepper and olive oil. Cook over medium high heat on a grill pan or barbeque, turning once. Approximately 3-4 minutes per side. Set aside. 1. Cook rice in water. Toss cooked rice with salt, pepper, olive oil, onion and dried oregano. 1. Put everything, except the olives into a salad bowl, season with salt and pepper to taste. Serve the cod and salad over the rice. Garnish with pitted olives.